An important technical caveat is that subcapsular dissection should proceed in close contact with the whitish surface of the prostatic adenoma, with this plane being further developed bluntly with a combination of J-hook electrocautery, harmonic scalpel, Sotelo prostatome, or suction-irrigation cannula tip. 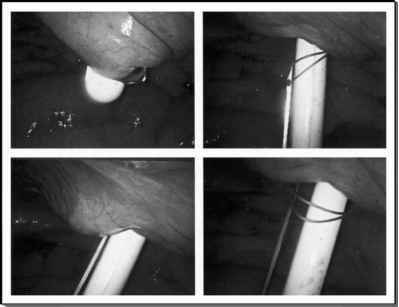 Small vessels entering the adenoma can thus be precisely identified and electrocoagulated. FIGURE9 ■ The prostatotome. A metallic curvilinear-tip laparoscopic instrument with a sharp cold-knife in the distal side of the forceps to facilitate the enucleation of the adenoma. Abbreviation: BPH, benign prostatic hypertrophy. Abbreviation: AUA,American Urology Association; NA, data not available. Maintaining a thick prostate capsule is important to minimize violation of the subcapsular venous plexus. Using this technique we have not encountered significant hemorrhage from the prostatic vessels entering the prostatic capsule at the 4 o'clock and 8 o'clock positions. Attempting to extract the entire prostatic lobe intact may actually impair visualization, contributing to increased blood loss. Hence, piecemeal excision of the already mobilized part of the adenoma provides superior visualization of the remaining part of the adenoma, allowing better hemostasis.